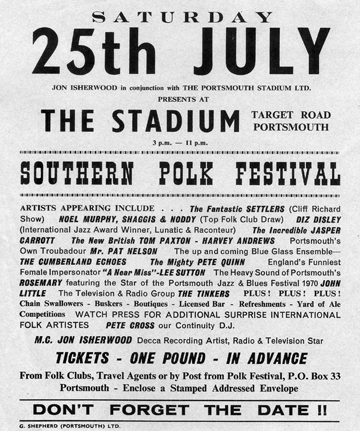 The festival at Portsmouth Greyhound Stadium. The stadium is no longer there, the large scoreboard at the back of the temporary stage was demolished in January 2012. The smallest audience I ever played to was at a gig organized by Jon. 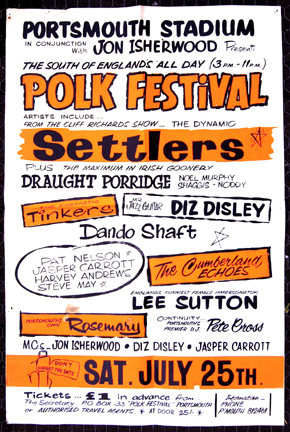 He brought me down from the midlands to appear on his “folk festival” held at a greyhound stadium in Portsmouth. Hoping to attract a crowd of 15,000 he booked some big folk names, distributed 100,000 leaflets along the south coast, took out pages in local newspapers and built a huge stage with a paling fence to keep the crowd away. 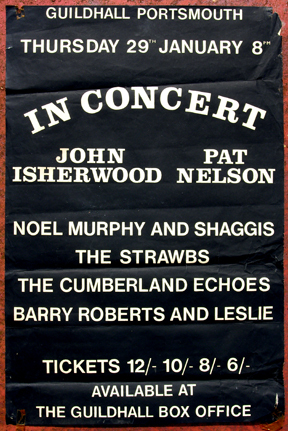 When I went on, the first act, at three o'clock in the afternoon there were forty-six paying customers. Apart from six families picnicking around the bottom of the paling fence, everyone, including the acts, were in the bar. To Jon's credit, we all got paid and he was held affectionately in our minds forever after. The funniest thing to come out of Portsmouth. An alternative comic before they were fashionable, original, innovative and inspirational. He was much admired and will be sadly missed. 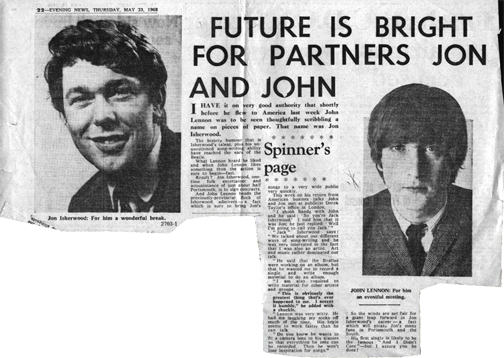 Jon also met with John Lennon and there were discussions about him recording for the Beatles Apple label, he didn't, but there must have been some arrangement because after a lot of badgering Jon eventually got a cheque from George Harrison for £1.10p. 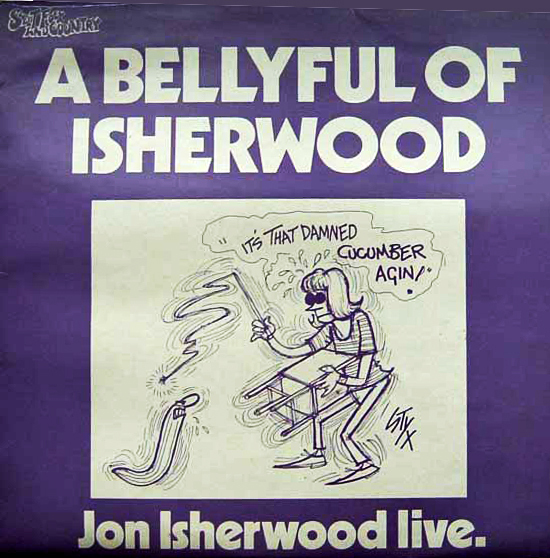 "Isherwood Alone" that was pressed in the early sixties, though I don't know of any copies in existence'. That is absolutely astonishing. I am finding it hard to believe what my eyes are telling me! 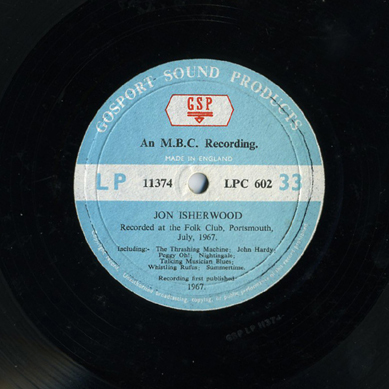 My Dad spoke of only one other album which he recorded called “Isherwood alone” and I must have contacted about half of the Portsmouth folk scene to see if anyone knew of its existence, but nobody had, so I put it down to one of his ‘tales’. But now, I can clearly see that there was another album - I’m gobsmacked! If you could somehow get a copy of what is on it, I would be extremely grateful. Regards Jon. I gave Jon the LP because it should be with him. The engineer who recorded the live album was Peter Copeland, an accomplished BBC sound archivist. 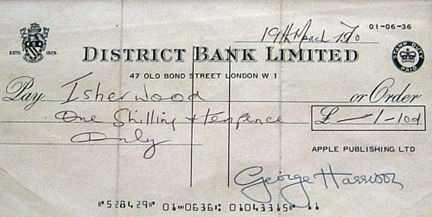 Gosport Sound Products was a label run from his bedroom. http://en.wikipedia.org/wiki/Peter_Copeland. 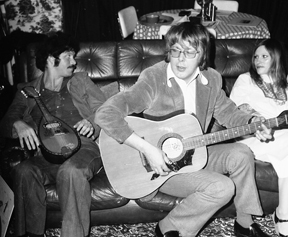 Terry Schulman and Jon Isherwood at my flat after performing at a folk club in Portsmouth, 1977. Jon passed away in Moate, Co., Westmeath in 2002, where he had lived and sung﻿ with many of the musicians who live there. 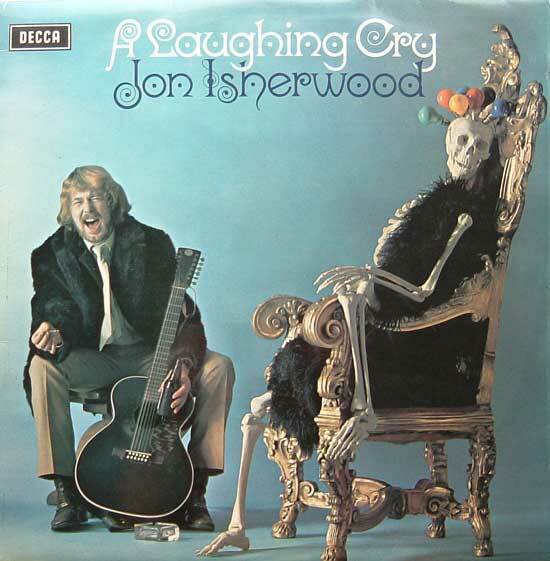 His son has a website at http://www.jon-isherwood.com with audio and video clips and peoples memories of Jon. There are also videos on YouTube.